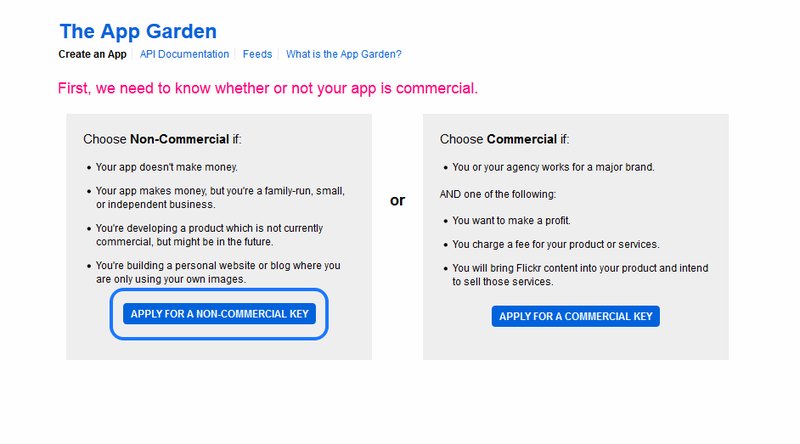 The Flickr API is available for Commercial & Non Commercial use by outside developers and Flickr users. Flickr API can be used to configure your application on different platforms and applications like Android Phone Apps, Web Applications, Various Plugins & Extensions. Apps use your Flickr API key to fetch information from your account, get you photo stream, photo albums and your photo collection. Open the below link to get your Flickr API Key. Make sure you are already logged into your Flickr account before going to click on below link. Link will redirect your to Flickr API Key apply page. Click on “Apply for your key online now” link same as below screenshot. Next screen will ask you to Usage of Flickr API Key. Next screen will ask you where you are using this API Key. So, please give the details as like below screenshot. For example we are using this API Key with Flickr Album Gallery plugin and this is a non commercial plugin to display Flickr account Album Gallery on your WordPress blog. So, proved the Flickr App details where you are planning to use this API Key and click on SUBMIT button. 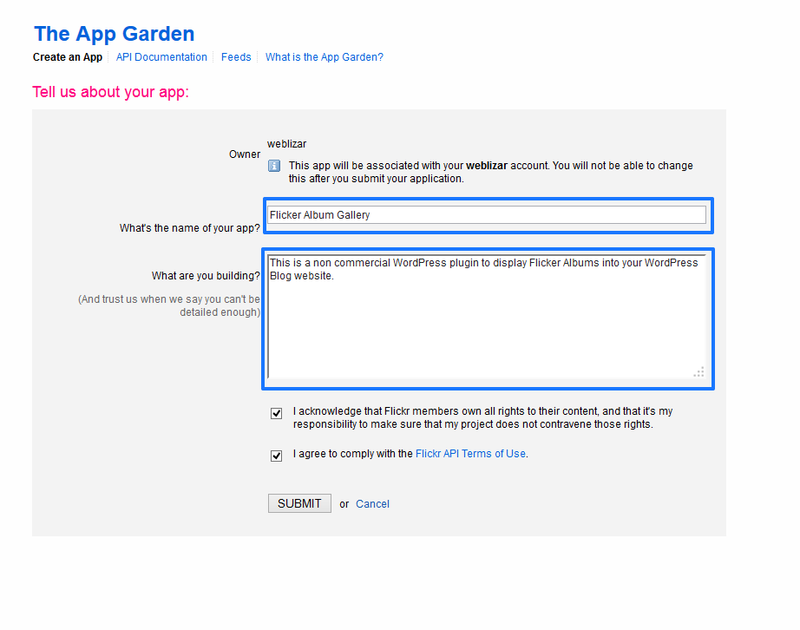 After submit form on previous page you will get your Flickr API Key on next screen. 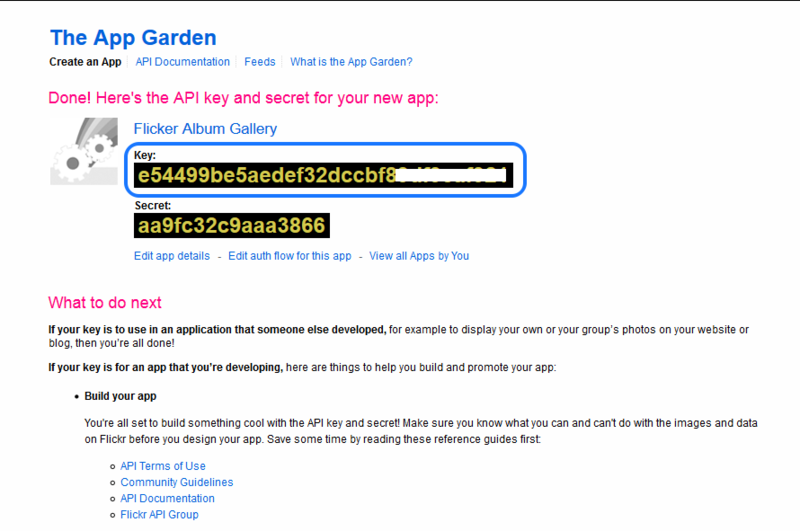 Below screenshot showing your new generated Flickr API Key. Thanks for reading this article. Please provide your feedback to encourage us to provide you more useful tutorials on different useful topics. error generating page message occurred even though I have entered the Key and Album Id correctly. Please advise. I am receiving the message error generating page with my own API key and album ID. Hi, I think what is going on is: you are adding the “secret” numbers provided by Flickr instead the Album Id as the second field requests. I had the same issue as everyone above, where I was getting an error displaying my images, despite the correct album id and API key. Then it occurred to me that my image permissions on Flickr were set to private. Once I changed viewing permissions to public, the images appeared. Please share your issue on email. We will help you. Got this app working fine but it only shows the photos from page 1, how do i get it to load all pages in a folder? Do i need the pro version for this? Please share your complete problem on our mail at – lizarweb [at] gmail [dot] com. Don’t forget to share site URL. After loading in my api key and my album key only two pictures from my album shows up. It currently has 5 photos in the album. Any recommendations? Make sure your all images is publically visible.